evapo-transpiration from a vegetated land-surface utilizing the Penman-Monteith equation (Monteith, 1965, 1981). Variants of these two representations are widely used in land-surface schemes of climate and distributed hydrologic models (e.g., Dickinson et al., 1986; Beven, 1979). To accurately compute fluxes of soil water to the atmosphere, energy fluxes between the atmosphere and the ground must first be computed. These energy, or radiation, fluxes, discussed in Section 9.1.1, are the forcing terms in the evapo-transpiration calculations. Ground temperature is an important component in both the Deardorff and Penman-Monteith formulations, and the fluxes computed in Section 9.1.1 are used in the computation of the ground temperature as described in Section 9.1.2. A detailed presentation of the Deardorff method in Section 9.1.3 describes how the computed fluxes and ground temperatures can be related to bare-soil evaporation. Section 9.1.4 details how the computed fluxes are adjusted and applied for computation of evapo-transpiration with the Penman-Monteith equation. Finally, Section 9.1.5 describes the additional inputs needed for ET calculations. Realistic estimates of incoming and outgoing radiation fluxes are needed for accurate estimates of ET. The important components of the energy budget are long-wave radiation, discussed in Section 9.1.1.1, short wave radiation, discussed in Section 9.1.1.2, and heat conduction into the soil, Section 9.1.1.3. Influences of soil, water, vegetation and cloud albedos, atmospheric emissivities, and sloping-terrain effects on energy fluxes must be included in the calculations. The effects of albedos and emissivities are of great importance in determining radiation fluxes and warrant detailed representation (Pielke, 1984). where: A is the albedo, and Rs, direct and Rs, diffuse are direct and diffuse contributions of short-wave radiation, respectively. where: λ is the angle from the observer’s horizon to the center of the solar disk, and is often referred to as the “solar elevation angle”. Calculation of λ is discussed below. Lee (1978) noted that the difference between Rs,diffuse and Rs,horiz.,diffuse is only 2% for slopes less than 30%. Lee (1978) also showed that for slopes less than 36%, the contribution to the total solar radiation by the reflection of total solar from surrounding sloped terrain is only 3% or less. The diffuse horizontal radiation, Rs,horiz.,diffuse data are extracted from NOAA-NREL CD-ROMs, and hence atmospheric scattering and absorption effects are neglected. where N is the fraction of sky covered by clouds. where: Pa is the atmospheric pressure in kPa, and Ta is the air temperature in °C. Because ground temperature appears explicitly in the outgoing long-wave energy flux-term, and implicitly in the Deardorff (1978) and Penman-Monteith evaporation formulae, it is important for radiation and evaporation calculations. Ground temperature varies considerably during the diurnal cycle and is not generally measured or provided by meteorological or weather stations. In GSSHA the ground temperature is obtained numerically by solving the surface energy balance equation with the Newton-Raphson iterative method as described by Deardorff (1978). where: the terms Hs, Rl, Rs and G have been previously defined, and E is the evaporation latent heat flux (W/m2) from bare soil, as described in Section 9.1.3.
where: ε is the ratio of molecular weight of water vapor to that for dry air (0.622), and qa is the specific humidity, estimated by substituting e = rhes for es, where rh is the relative humidity. A convergence criterion, δe of 0.001 °K is utilized in this analysis. When the convergence criterion is satisfied the Clausius-Clapeyron equation is solved, and Tgn = Tgk+1. Evaporation from a bare surface can be computed using the Deardorff equation by specifying the ET_CALC_DEARDORFF card in the project file. When using the Deardorff method only the physical components of evaporation are considered. Plants are not considered. Compared to the Penman-Montieth method (1971), use of the Deardorff method can result in higher evaporation and lower soil moistures because residual soil moisture is the lower limit on soil moisture and resistance of the plant canopy to evaporation is not considered. The Deardorff method is not appropriate in vegetated areas and have limited applicability. Inputs to the mapping table for ET calculations, described below, are the same for the two methods. rc is the (Monteith) canopy resistance (s/m) to the transport of water from some region within or below the evaporating surface to the surface itself. The canopy resistance is expected to be a function of the stomatal resistance of individual leaves. Under wet-canopy conditions rc = 0. Rs is the net incoming short-wave radiation at the reference level z, (W/m2) Section 9.1.1.1. Rl is the net long-wave radiation at the reference level z, (W/m2) Section 9.1.1.2. G denotes the sum of energy fluxes into the ground, to adsorption by photosynthesis and respiration and to storage between ground level and z (in W/m2), Section 9.1.1.3.
where: zu and ze are the heights of the wind speed and humidity measurements (m), respectively, and Uz is the wind speed (m/s). Following Brutsaert (1975), zom is assumed to be 0.123hc and zov is assumed to equal 0.0123hc, where hc is the mean height of the crop (m). According to Monteith (1981) d = 0.67 hc. Calculation of evapo-transpiration requires additional parameter values be assigned to every active grid cell. These parameters may be assigned with either the Mapping Table File, Section 11, or GRASS ASCII maps specified with project cards described in Section 3.8. ET parameters are typically assigned with a combination soil texture/land use (STLU) index map. The Deardorff method requires values of land surface albedo. For the Penman-Monteith method, values of land surface albedo, vegetation height, vegetation canopy resistance, and vegetation transmission coefficient are needed. Ground surface temperature calculations, discussed in Section 9.1.2, require values of land surface albedo, which describe the fraction of long-wave radiation reflected back to the atmosphere. Values range from 0.0 to 1.0. Literature values for a variety of land covers compiled from a number of sources are listed in Table 11. Table 11 – Land surface albedo values Notes: aThe smaller value is for high zenith angles; the larger value is for low zenith angles. From bSellers (1965); cMunn (1966); dRosenburg (1974); eOke (1973); fLee (1978); gde Jong (1973); hAtwater and Ball (1981); and iEagleson (1970). Plants lose water through their leaves through a process called transpiration. This water is lost through small opening in the leaves called stomata. Inside the leaf the air is near saturation, and the difference between air saturation and leaf saturation causes the plant to lose moisture due to diffusion. The plant can control the loss of water by opening and closing the stomata. The loss of water vapor from plants can be calculated from a resistance law, where the difference in saturation between the interior of the leaf and the atmosphere is the forcing term, and the canopy stomatal resistance is the resisting term. The canopy stomatal resistance values entered in GSSHA must represent the resistance of the canopy for an entire grid cell. The canopy resistance is affected by coverage, time of day, and the type and condition of plants in the cell. Greater leaf coverage means lower resistance values. In GSSHA, noontime canopy resistance values are entered. Canopy resistance has a strong diurnal variation and the GSSHA model corrects the noontime canopy resistance for the time of day. Although stomatal resistances are not commonly available for mixed-vegetation types, data are available for a variety of single vegetation types (e.g. Szeicz and Long, (1969) for grass; Stewart and Thom (1973) for pine forest; Allen et al. (1989) for clipped grass and alfalfa). Noontime values of canopy resistance (s m-1) for different types of plant under different conditions are listed in Table 12. Table 12 - Canopy Stomatal Resistance Notes: aPielke (1984); bGash and Stewart (1975), cMonteith (1975); and dSceicz and Long (1969). The Penman-Monteith equation has been found to be very sensitive to the value of canopy resistance. As pointed out by Lemeur and Zhang (1990), a 10% error in canopy resistance will result in a 10% error in the estimated evapo-transpiration. Senarath et al (2000) found that the discharges calculated during long-term simulations with CASC2D were also sensitive to the canopy resistance. In the northern hemisphere temperate zone ET is subject to strong seasonal variations. ET is dependent on both climatic conditions and the vegetative cover. The seasonal variability of climatic conditions is reflected in the model with the hourly hydrometeorological inputs (Senarath et al., 2000). Vegetative cover is represented with simple land use/land cover indexes, such as forest, pasture, etc. Seasonal changes in vegetation cover are best simulated with plant growth models. Comprehensive plant growth models, such as SWAT (Arnold et al., 1999), and hydrologic models that include comprehensive plant growth models, TOPOG_IRM (Dawes et al., 1997) require extensive information on plant communities and growing conditions. Such detailed data are not routinely available. Senarath et al. (2000) determined that of the ET parameters used in the Penman-Monteith equation, evapo-transpiration is most sensitive to the value of canopy resistance, and is quite insensitive to the other ET parameters. Leaf area and canopy resistance can vary by as much as several hundred percent during the year for crops, grasses, and deciduous forest in temperate regions (Monteith, 1975; Doorenbos and Pruitt, 1977; Federer and Lash, 1978). Based on this information, the canopy resistance was chosen as the vehicle to incorporate seasonal variability of ET in the GSSHA model. Fall/Winter - for the period November through February, plants are dormant and transpire little water to the atmosphere. 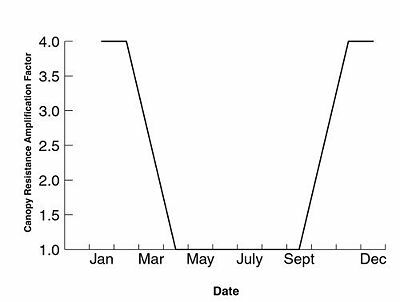 Use of this simple method at the Goodwin Creek Experimental Watershed (GCEW) in north Mississippi resulted in improved predictions of soil moistures and outlet discharge for periods outside the summer growing season (Downer, 2002a). The timing of seasonal changes should be adjusted to make the method applicable to climates different from that of southeast region of North America. In GSSHA versions 5.x and higher, the above noted default values are applied for latitudes of 37 degrees and below. For latitudes greater than 37 degrees spring comes later and summer comes earlier; the four inflection points are April, July, September, and October. In versions 6.1 and above, these inflection points can be specified in the project file. The vegetation height is required to compute the aerodynamic resistance term in the calculation of turbulent diffusion. Vegetation heights are entered in meters. Sample values are listed in Table 13 (from Eagleson, 1970). The values may not be the representative, expected vegetation height-values of these vegetation/forest types. The plant canopy can prevent radiation from reaching the ground surface, reducing the amount of radiation available to heat the ground surface and produce evaporation. The vegetation transmission coefficient describes the fraction of light that penetrates the vegetation canopy and reaches the ground. Values can range between 0.0, total canopy blocking of sunlight, to 1.0, total light penetration on bare soil. Table 14 list measured values of canopy resistance for grass. Table 14 - Vegetation transmission coefficient values for grass Notes: Data from O.G. Sutton, “Micrometeorology,” McGraw Hill, New York, 1953. This page was last modified on 17 December 2013, at 21:37.